politicalbetting.com » Blog Archive » Could punters be getting it wrong again? « What did Iain Dale mean by this intriguing Tweet? Could punters be getting it wrong again? Will a big line-up make it harder to predict? Above is a clip from the Guardian on the day that voting packs went out on the last occasion that Labour’s election machinery was used – the June 2007 deputy election. 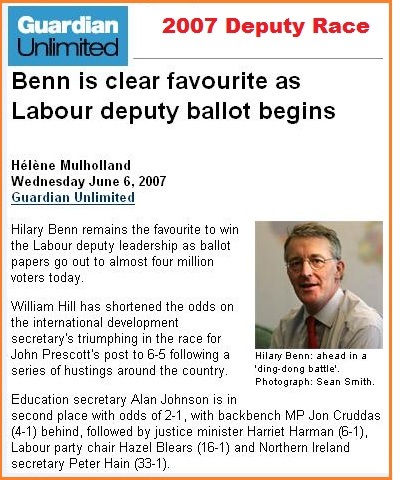 At this point, just seventeen days before the result was announced, the firm favourite at 6/5 was Hilary Benn. Behind him in the betting came Alan Johnson (2/1), John Cruddas (4/1), Harriet Harman 6/1, Hazel Blears 16/1 and Peter Hain 33/1. So with not that much time to go the eventual winner was fourth in the betting while the favourite finished up fourth. I raise this to make the point that I’ve emphasised before – because the Labour leadership election is an exhaustive ballot then second, third or even fourth preferences could be critical. And the more candidates that are in the race the more difficult prediction becomes. If a fourth, and possibly a fifth, does gather enough nominations then , I’d suggest, David Miliband’s task becomes harder.